We have been slowly adding new and old stuff to our inventory and here are some of the items. Top left is a box of Canadian green BIC pens. Thanks Sam. Below the BICs is a new Parker Vector, Papermate Holiday in perfect condition and another Parker Epic. I now have two Epics in my collection. More old BIC Wavelengths pencils from around 1991. Thanks again Sam. Middle top is a PEZ Calculator. Below that is a Sterling Plastic Creepy Pencil Sharpener NR# 618 from around 1963. I have a few of the spiders but this is the first on a card. To their right are the four colored BICs in fine point. Already had the medium points. Next is a Scripto pen and pencil set. Great condition. Pencil is a P360 and the Pen is a T220. Last is a set of BIC Spider-man MVP Erasable pens. Add all this stuff to your collection. Some of the best new BIC pens to come out in some time. These are fine point 0.5mm pens. The 0.5mm point is a new one for the BIC Round Stic. I have only seen these pens available from two seller on eBay. One from Korea and one from Thailand. These are well worth the price and the refills can be taken out and put in any other BIC round stic pen to include the BAUX pens from Kickstarters. These pens also have bright new colors that I like. Add them all to your collection. Who did not have one of these? This one is the 1967 blue tray Spirograph Nr# 401. This one is complete except that the small number 24 wheel is missing. and the pens need new refills. All the instructions are there. Developed by British engineer Denys Fisher in 1965. In 1966 Kenner got the rights for the US market and it began selling them that year. It seems they come out with a new addition every few years so there are plenty of chances to get one. I like this old one because of the art work on the cover and that it is almost complete after so many years. 1967 was a good year. Add one to your collection. If you like the pens you will love the song. Who does not remember doing the Ops N Pops dance? You can go to YouTube and see the video but I had to have the 45. Add all these great pens and music to your collection. This year I plan on sending two Opn N Pops to Mad Men. This will be the last year for the TV show so I plan on getting some nice pens some air time. Add them all to your collection and watch Mad Men. One of the first pencils from the 70s that I collected were the Pentel PD345s. Solid colors came first then the clear ones. 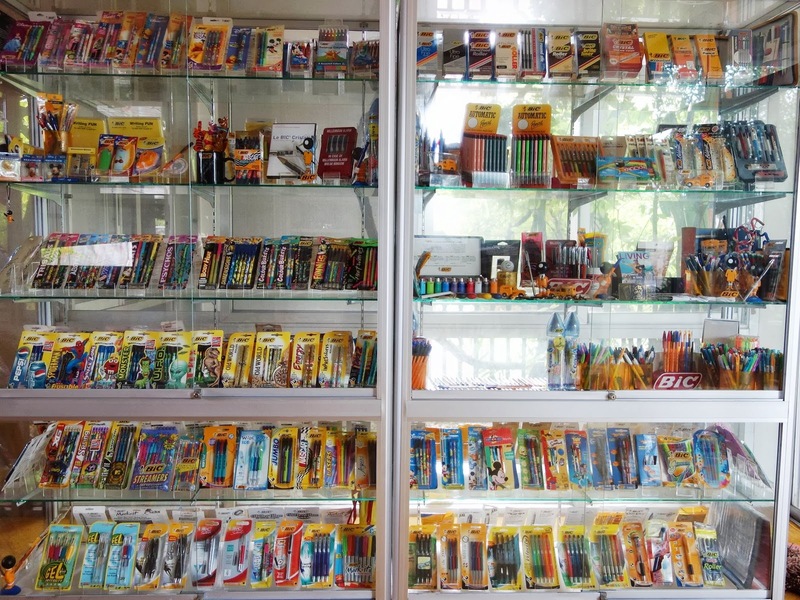 I was in Germany in the mid 70s and I would go down town to the local stationary stores looking for pens and pencils. On the left is a solid orange PD 345, then a clear blue PD345. The third one is a clear PD 345 with a green clicker from Mexico. Then we have a green and white PD 335. My PD 505 all metal sideclicker is next and is one of my best pencils. Thanks Germ. Last is my newest one. A retired gray PD 515 Popnpop. Never seen one before. This PD 515 has a metal tip that houses the point while all the others have plastic ones. The PD 515 is a great addition to my collection. Add all these great pencils to your collection. Here we have my most recent order from JetPens. First is the R-301 rollerball pen. I had the black one and this one is blue. Next is this real neat 6" ruler that can fold into a L shape. A must for everyone. I started using one of my Lamy fountain pens so I picked up the florescence orange ink. I believe the best item in the lot is this new plastic pencil sharpener that you rock back and forth to sharpen so your hand does not have to twist around. It also clicks when the point is ready. How do you beat that? Pencil caps are nice and last is the Zebra Mulsion ball point pen. All very nice stuff so get over to JetPens and add all this stuff to your collection. Pentel EnerGel has been a very popular pen and now we get more colors. The silver, pink, and black have all been in our local box stationary stores. I added the dark blue and the gold from a seller in Japan. Now we get a light blue. I enjoy all the colors but I was surprised to see a dark and light blue. I would have gone with a red or green. So there are now six colors to choose from so add them all to your collection. The Scripto K780 is the most notable and popular of the Scripto pencils but there are others that you may want to add to your collection. All these pencils use the standard Scripto 1.1mm size lead except the P452 on the left. The P452 TOP-AD pencil is new to the supply room and uses 0.9mm lead. It gets it's name from the Ad just under the eraser. Next is a Scripto 4-47 pencil from the late 40s and early 50s. Many of these pencils were used for advertising and can be found on eBay. They are a very thin pencil. I have five of them in my collection. Next is a ME-1. A real good looking old Scripto pencil in blue. To it's right is a M800 model used for advertising followed by the pearl version of the M800. There are plenty of variations of these M800s with some being called MP-1s. Both these M800s appear to have never been used. Last is the Scripto Wordmaster and considered by many to be one of the best pencils ever made by Scripto. All these great pencils should be in your collection. This Is A BIC Collection!! This is a BIC collection that any BIC pen collector would love to own. Not only does the collection seem to cover all the bases but they put the collection is the proper display cabinets to highlight the entire massive collection. This collection is made up of modern BIC products since about the 1990s or late 80s. This is impressive. Hard to believe BIC had these many products over the years. Candy from Thailand is the owner of these BICs. She is selling some BIC extras from the collection and she can be found on eBay. Add this collection to your collection.